Critical care nurses are responsible for the most vulnerable patients. They have the responsibility to vigilantly monitor, assess and treat the critically ill, while providing support to their families. Whether you are a new critical care nurse, an experienced critical care nurse or a nurse interested in working in the critical care unit, this program offers a flexible professional development opportunity by enabling you to access continued learning regardless of your location, shift pattern or other commitments. This program is designed for students with previous education. Please see the entrance requirements section of this page for more detail. Designed for registered nurses (RNs), it consists of an introductory course to e-learning, five theoretical courses offered online, a critical care simulation component held at Durham College or a partner site and hands-on preceptored experience in a CCU. 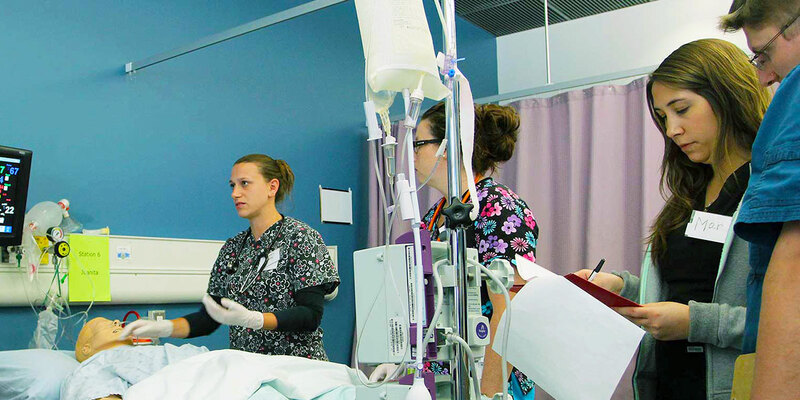 If you are a novice or experienced critical care nurse or if you are interested in working in the critical care unit, this program offers flexible learning and certification. The program begins with a brief course on the study methods required in an e-learning environment which is key to your success in the remaining five e-learning critical care courses. A measurement of your knowledge and competency will occur throughout each e-learning course. Following successful completion of six online courses, you will complete the 39-hour simulation component of the program. The Simulation course takes place at Durham College or one of its partner sites. This course provides an opportunity to apply the theoretical knowledge to integrated case-based scenarios facilitated by an experienced inter-professional team of instructors. Please note: The advanced concepts and theory introduced in this program builds on prior foundational knowledge from nursing, acute care experience is highly recommended. Fourth-year Bachelor of Science in Nursing students can also apply to the program but will not be able to complete the practicum portion until proof of RN registration is provided. The final component of the program is an integrated practicum, which includes 120 hours of clinical practice in an adult critical care practice environment. You will demonstrate competency in the Standards of Practice for Critical Care Nursing in Ontario under the direct preceptorship/mentorship of an experienced critical care nurse and the facilitation of a Durham College faculty advisor. Upon successful completion of the program, a critical care certificate will be awarded. Transfer credit, advanced standing or challenge will be considered on an individual basis. Please visit www.durhamcollege.ca/criticalcare or contact the program co-ordinator. Please note: You will be required to adhere to and meet the pre-placement documentation requirements of the host agency. For students living and working outside of Ontario, practicum placements outside of the province of Ontario (but in Canada) MAY be accommodated if an affiliation agreement between Durham College and the out-of-Ontario organization can be arranged. If you are considering an out-of-Ontario placement, you will need to self-identify yourself to Durham College prior to confirming your acceptance to the program.